In medium microwavable bowl, microwave candy coating uncovered on High 1 minute; stir. Microwave in 15-second increments, stirring after each, until smooth. Stir in cereal until well coated. Stir in 1/3 cup chopped strawberries and the marshmallows. Drop mixture by small teaspoonfuls onto cooking parchment paper. In small microwavable bowl, microwave peanut butter chips uncovered on Medium (50%) 1 minute; stir. If necessary, return to microwave for 15-second increments, stirring after each, until smooth. Transfer to resealable food-storage plastic bag. Cut 1/8-inch tip off 1 bottom corner of bag. 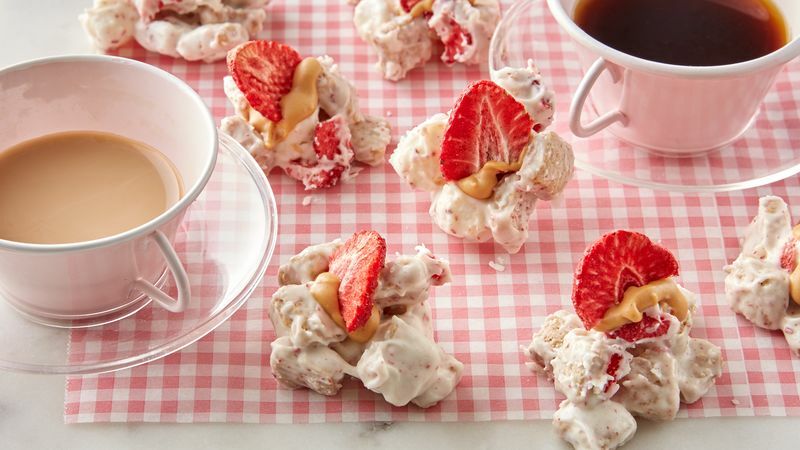 Drizzle on top of bites; top with freeze-dried strawberry halves. Cool at least 15 minutes until set. Blueberry Tiny Toast™ cereal would also work in this recipe; try substituting freeze-dried blueberries for the strawberries. Store cereal bites in covered container at room temperature.